The Trump administration is following through on its promise to use more private contract prisons, with the Justice Department seeking to identify inmates to transfer out of government-owned facilities and to cut federal guard positions. The Bureau of Prisons has the stated goal of “increasing population levels in private contract facilities,” according to a memorandum sent by the agency’s Assistant Director for Correctional Programs Division Frank Lara on Wednesday and obtained by Government Executive. In Wednesday’s memo, Lara tasked facility leaders with identifying inmates to transfer to private contract prisons, saying it would “alleviate the overcrowding at Bureau of Prisons’ institutions and maximize the effectiveness of private contracts.” Lara laid out certain criteria for determining which inmates should be transferred, such as those designated “low security” and those having 90 months or less remaining on their sentence. The memo came just days after the bureau held a conference call with facility administrators, instructing them to prepare for a 12 percent to 14 percent reduction in their authorized staffing levels. Such cuts would result in shedding 5,000-6,000 jobs, at least some of which are currently vacant. Trump’s fiscal 2018 budget proposed a cut of about 6,000 bureau positions, more than 1,800 of which were correctional officers. Congress has yet to enact full-year appropriations for the current fiscal year and those cuts have yet to take place. The bureau began contracting with private prisons in 1997 to address overcrowding. Contract facilities housed about 18,000 federal inmates, about 10 percent of the total population. A 2016 inspector general report found the contract prisons “incurred more safety and security incidents per capita than comparable BOP institutions and that the BOP needs to improve how it monitors contract prisons in several areas.” The private facilities confiscated eight times as many contraband cell phones, had higher rates of assaults (both inmate-on-inmate and inmate-on-officer) and were placing inmates’ rights and needs at risk. The Bureau of Prisons did not respond to multiple inquiries regarding the new memo or workforce changes. Democratic lawmakers have criticized the decision to increase the reliance on contract prisons at the federal level, and accused Justice of nefarious motives. Sens. Cory Booker, D-N.J., and Chris Van Hollen, D-Md., wrote to Sessions in April to ask about the appearance of rewarding political donors and hindering “recent progress towards reforming our criminal justice system.” They questioned Sessions on what evidence his department had that contract prisons would make people safer and lead to cost savings. The senators never heard back from Sessions regarding the letter, said Van Hollen, who called Justice's decision to move forward with its push for private prisons "unacceptable." Eric Young, president of the American Federation of Government Employees council that represents bureau employees, said the recent shift would have the opposite effect. The bureau’s contracts are generally fixed-price, he said, so the contractor gets the same payout whether it houses 200 inmates or 2,000. He added the renewed threat of workforce cuts has caused discord among the bureau’s employees. “It has sent a panic throughout my ranks,” Young said. Employees are worried if natural attrition and vacancy elimination alone do not reach the bureau’s targeted cuts, it could lead to mandatory layoffs. Not backfilling positions would worsen existing staffing shortfalls, Young said. He noted that at one facility, 20 officers retired at the end of 2017. “The staff is in very big fear because those 20 people are 20 less people responding to a situation in an emergency,” Young said. Nicole Porter, director of advocacy for The Sentencing Project, called it “curious” that the Trump administration is seeking to boost reliance on private prisons given the reduction in the overall inmate population in recent years. The federal inmate population has dropped by about 36,000 since 2013, according to bureau statistics, a 16 percent reduction. 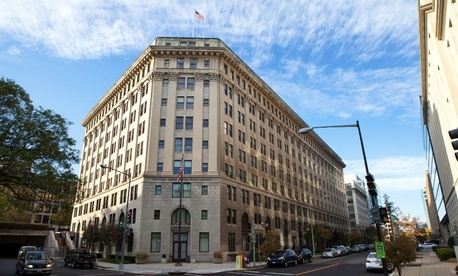 Porter said it was not surprising the agency was looking to shed workers, however, given the overall budget environment. This story has been updated with additional comment from Sen. Chris Van Hollen. Image via Mark Van Scyoc/Shutterstock.com.